SAN FRANCISCO — NASA is considering dropping two robotic landers on the surface of Jupiter's moon Europa, a body that many scientists regard as the solar system's best bet for harboring life beyond Earth. Researchers at NASA's Jet Propulsion Laboratory (JPL) in Pasadena, Calif., are developing a concept mission that could launch in 2020 and deliver the landers to Europa about six years later. The chief goal would be to investigate whether life could ever have existed on the huge moon, which likely hosts an ocean of liquid water beneath its icy shell. 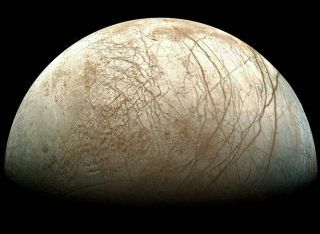 "Europa, I think, is the premier place to go for extant life," said JPL's Kevin Hand, who laid out the mission's basics in a talk here Thursday (Dec. 8) at the annual winter meeting of the American Geophysical Union. "Europa really does give us this opportunity to look for living life in the ocean that is there today, and has been there for much of the history of the solar system." The researchers' concept calls for launching two identical landers, each of which weighs 704 pounds (320 kilograms) and carries 79 pounds (36 kg) of scientific instruments. The redundancy is a hedge against the possibility of something going wrong. Each robot would use a mass spectrometer, seismometers and several different cameras to study its landing site. The mass spectrometer would be able to detect various organic chemicals — the building blocks of life as we know it — if they exist in Europa's ice, whereas the cameras and seismometers would shed light on the moon's geology. Jupiter constantly bombards Europa and its environs with powerful radiation. However, the landers won't sport much of a protective shield, Hand said. Such radiation shielding is heavy, and mission planners want to devote as much weight as possible to the robots' scientific gear. So the landers' prime mission is being designed to last for just seven days, to make sure they get their work done before the radiation takes its toll. But it's possible the robots could last longer than that, Hand said. While many astrobiologists are itching to know whether or not life exists on Europa, the potential mission would not be explicitly to detect life itself, Hand said. Rather, much like NASA's recently launched Mars Science Laboratory Curiosity rover mission, it would assess the location's ability to support past and present life. "This is a habitability mission," Hand told SPACE.com. He stressed that the lander mission is just a concept at the moment, and many details would have to be worked out before it could ever get off the ground. "This was an engineering proof of concept," Hand said of the study he presented. "We were just trying to see, 'Could this be done?'" Still, the results of the study are encouraging, he added. The Europa lander mission would require no huge technological leaps; it could be ready to launch by 2020, with arrival on the moon's surface by 2026 or so. Hand didn't give an estimated cost for the lander effort, but he said it would likely fall between two categories of NASA projects, called New Frontiers missions and Flagship missions (the latter is the most expensive type, and includes the Curiosity rover). That might put its price tag in the range of $800 million to $2 billion. NASA is also considering a different mission that would send a spacecraft to study Europa, which is slightly smaller than Earth's moon, from orbit. The Jupiter Europa Orbiter mission would launch in 2020 and cost about $4.7 billion, officials have said.